“I’m just not creative. I can never do creative things,” says the discouraged homeschool mama. I’ve heard these words so many times from frustrated mamas. We’ve all been there, right? Our homeschool feels dry and boring. The days have gotten long. We might be checking off all the boxes, but there doesn’t seem to be much joy in the process. 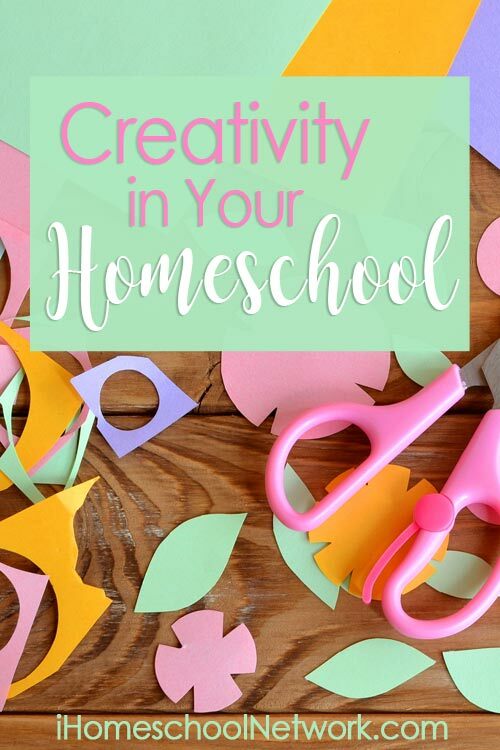 Creativity in your homeschool is difficult! We just wrapped up a homeschool year that didn’t feel so fun or exciting. Everything that needed to get finished was finished but that was about it. What we needed was some sparkle. We needed a little spark that could get us away from the doldrums. You might think you’re not creative or you just don’t have those “sparkle” genes. Guess what? All you need is a little spark to get your creative juices flowing and you’ll be on your way to a more fun, more exciting, more enjoyable homeschool experience. Here’s a list to get you started and help you get creative! Mark special days with new traditions. The first day of school, the last day of school, birthdays–these are all big reasons to celebrate! Start some new traditions with your kids. Do NOT make things too complicated though or it’ll never stick. Keep things simple. 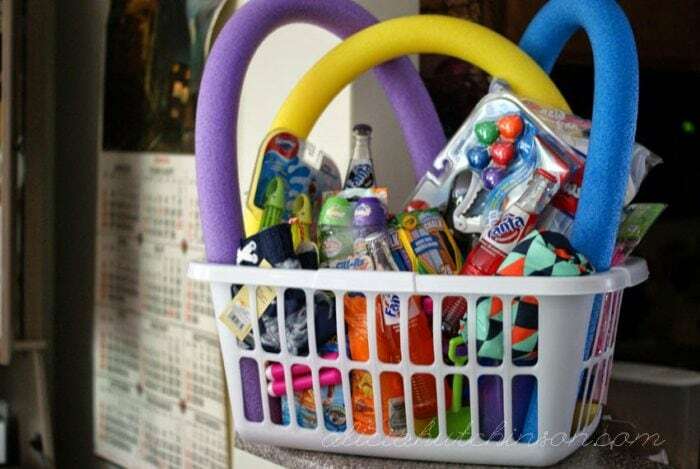 Celebrate the last day of school with a Summer Fun Basket! This has become a hugely anticipated tradition in our home. For about the month before school ends, I start gathering summer essentials and present it to the kids when they wake up on the last day of school. They love this! Another thing we love to do at the end of the school year is host our annual Hutchinson Art Show. We pull out all our best work from the school year, any projects, bake some cookies and invite our closest friends and family over. It’s an evening that the kids can show off what they’ve accomplished for the year, recite any memory work and learn how to host an event. The planning is part of the event too. They create the invitations, help bake the goodies, set up, and take coats at the door. It’s always a really fun night. 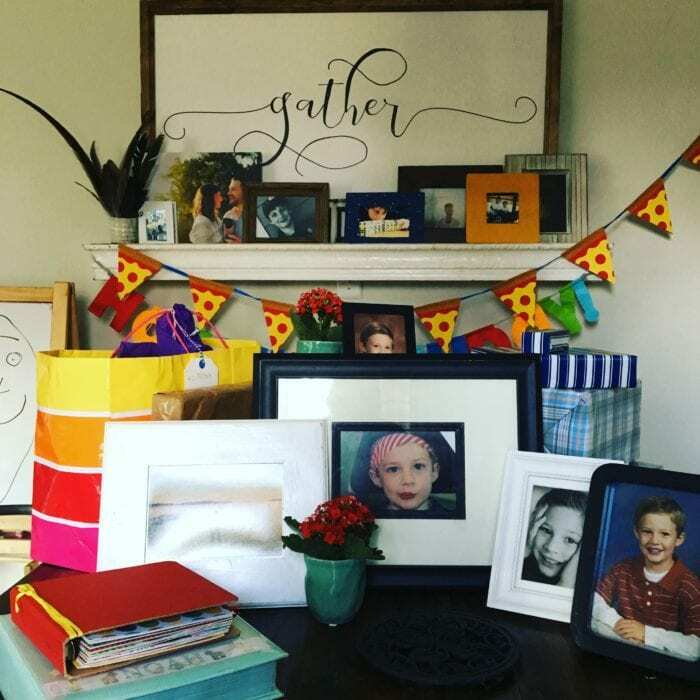 For birthdays, give your child their own personal “shrine” for the day. My kids love this one, too! On the coffee table, dining table, or another very visible spot, pull all the framed photos from around the house, special drawings they’ve done or any other special memento. Set these up on the table before they wake up on the morning of their birthday along with birthday gifts and balloons. (We also add in donuts!) This is a super simple, easy way to make your child feel loved and special on their day. Add some extra umph to the everyday. It’s hard to be the fun mom all the time–and no mom is. But some weeks just call for a little more fun–just because. Tuck a fun-sized candy bar into your kids’ pen bag. Practice math facts on the trampoline or bounce a ball back and forth while your child calls out the answers. On a hard day or if the weather’s bad and you all need a little pick-me-up, make lunch into a picnic and eat it on the living room floor with a blanket. Or just break out the cookie cutters and cut the regular ol’ sandwiches into shapes. Super simple, but also really fun. Bring your school work to the library, the coffee shop, or the park for a change of scenery. If your language arts regime is starting to feel boring, we love using Brave Writer’s Arrow and Boomerang guides. It really helps to simplify things without sacrificing the girth of our learning. Did you know there’s a “holiday” for pretty much every day of the year? Blueberry Pancake Day, National Donut Day, Grandparents Day–these are all opportunities to celebrate without a ton of planning or extra effort. The smallest things are really the biggest things to your kids. Learning to tie shoes, reading their first chapter book, taking off the training wheels–all huge reasons to celebrate! When special things like this come along, set a special table for dinner and “cheers” to your child–they will love that! Or create a quick hand-drawn certificate to present to your child in front of the whole family. I hope this gets the wheels turning. Creating a little extra fun doesn’t have to mean extra work. Allowing margin in your day creates the space you might need to let the creativity in. Great ideas! When my boys were studying their multiplication facts I found these cute printable ice cream cones and scoops to keep track of the facts they knew and we threw a huge ice cream sundae party when they had both memorized all their facts.